This is one of those patterns that I’ve sat on forever, wondering why I haven’t made it yet. I love it every time I see someone else’s version, and I keep telling myself I’ll get to it, but then I never do. Well people, I finally got my you-know-what together and made one! 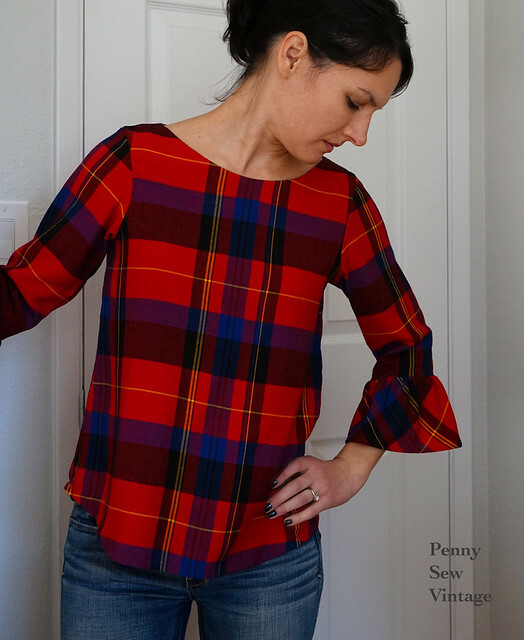 This is the Shoreline Boatneck Top/Dress pattern from Blank Slate Patterns. I’ve had it for some time now, and they’ve added a free expansion pack, or it might just come with the pattern now. Since I already had it, I had to go back for my expansion pack, so you might too if you’ve been sitting on yours like I have. 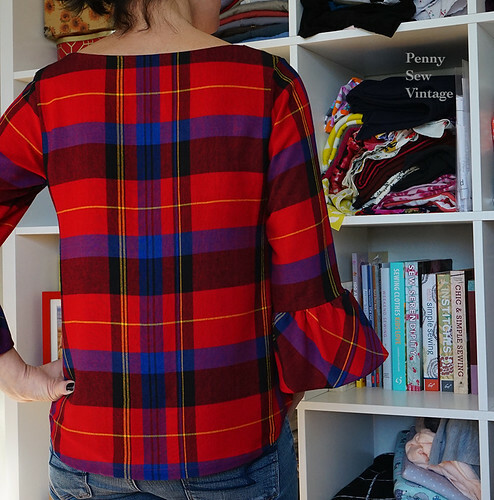 It’s such a classic top/dress, several sleeve options, perfect to show off some gorgeous fabric. With woven tops, I always have fitting changes I need to make, so it takes me awhile of looking at the designer’s size comments before choosing the one I want to start with. This pattern recommends to go with the high bust measurement for this pattern, so that would put me in M, but the rest of my measurements are in the XS. I decided to go somewhere in the middle and chose size S to make my first muslin. I followed the instructions for making a small bust adjustment (sba). The size S has a bust measurement of 35″, and mine is 33″, so I took the 2″ and divided that in half to get 1″. This is the number I used to make my first sba. This really just brought everything in way too much visually, but I decided to make a basic muslin just to see where I’d need to go. I just sew up the portion of the front and back from just under my bust, basting the seams which takes just minutes. It was definitely too tight at the upper bust and bust, but I could still make it work without going up a size. My second muslin I reduced my sba amount to 1/2″, and this fit much better. 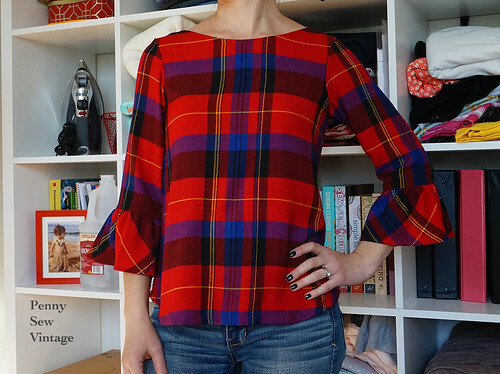 I also noticed I was getting some gaping in my back shoulder after attaching the sleeve (again, a muslin), so I followed the fitting instructions in Fit For Real People for a forward shoulder, and I moved my shoulder seam forward 1/4″ which got rid of the gaping. Here’s my final Halloween version in this super cute Cotton + Steel fabric. It’s called Skeleton Dance, part of their Boo collection, and although it’s quilting cotton, it’s great quality and very soft. You don’t see any gaping in the back shoulder thanks to the forward shoulder adjustment! 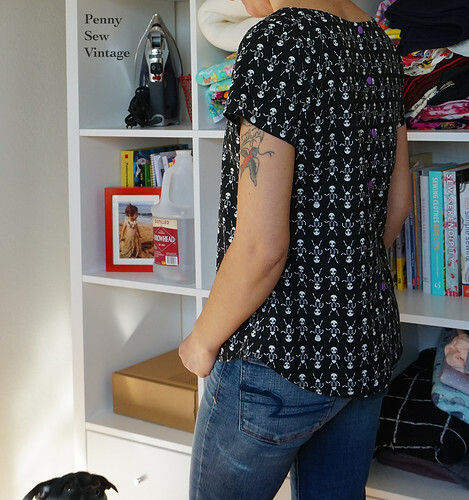 This version includes short sleeves and the back button placket. I added purple Kam snaps because it was fast and easy, and I like purple and black together. If you look closely at the skeletons, they each have their own little expressions and heart pelvises! So darn cute! My second version I added the “statement sleeves”, which I figure are fun for the holidays, plus I can remove them later if I want. I shortened the ruffle’s length a couple of inches though because I felt like they were just way too long for me. After looking at these pictures though, it looks like it’s a tad bit tight across the upper chest and may need a broad shoulder adjustment. I may have to tweak again, although it feels fine when I’m wearing it. This fabric was thrifted a couple of years ago, and it has tons of snaggy spots, but it feels like a cotton/rayon blend with soft drape and I love the plaid. I also have no problem pulling both tops over my head which makes getting dressed pretty quick and painless. I have no doubt I’ll be making loads of these in a variety of versions. Definitely the dress version come spring! This is such a quick pattern because there aren’t any darts or closures if you choose the original version. This is definitely my new go-to pattern! Anyone out there planning holiday sewing? 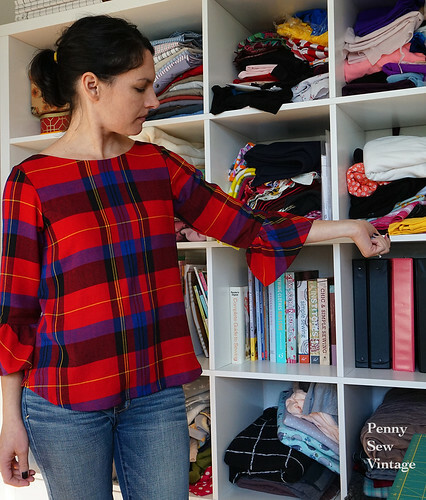 Are you sewing your holiday clothes? Holiday gifts? I just started my to-make list, maybe a little late, but it’s pretty manageable since I’m throwing in some knitting too. I guess we’ll see how far I get! 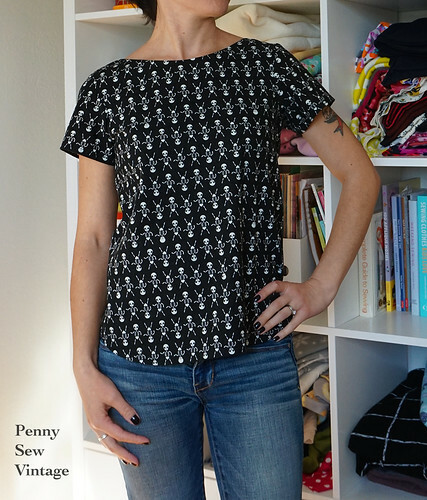 Previous PostPrevious The New York Minute Sew Along Starts Today!